One-Step Spot Kit was developed with the homeowner in mind. Now you can provide professional strength spotting materials to your customers without the resoiling and bleaching effect of consumer products. The Kit contains: 1. 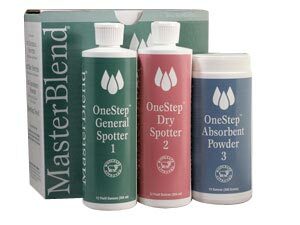 General Spotter #1 for water based spills and spots 2. Dry Spotter #2 for grease and oil based spots 3. Absorbent Powder #3, an extremely absorbent compound used to absorb spills and pet accidents or as a final step in spot removal to prevent wicking of spills. The container has a consumer spotting guide with easy to follow instructions indicating which product to use for a wide variety of spots and spills. The kit also contains a spotting towel.